A small stone chapel sitting atop a grassy knoll catches your eye immediately when you're driving from Odessa to Mecklenburg on Rt. 228. 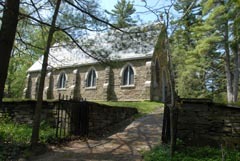 The Lawrence Chapel is surrounded by a stone wall and grove of trees. The secluded setting on Cayuta Lake gives the chapel a peaceful and charming air. This historic chapel is available for private functions, including weddings. The chapel was built in 1880 as a memorial to the children of Samuel and Elizabeth Lawrence. Nine of the ten children are buried in the nearby cemetery. The first marriage at the chapel took place in 1882, and the first baptism in 1884. The chapel and property were deeded to the Chemung County Historical Society in 1972 by Mrs. Adelaide Willett, heir of the Lawrence estate. The Lawrence Chapel is owned by the Chemung County Historical Society. It may be rented from April through October. The rental fee for weddings is $550.00. Income from rentals is used for maintenance of the chapel and grounds. Rental contracts may be obtained from the Society's headquarters at 415 East Water Street, Elmira, NY 14901, by phone (607) 734-4167 x 202 or by clicking on the link below. Click here for your Lawrence Chapel Contract and additional information. Before submitting an application, please call 607-734-4167 x 202 to confirm availability for your desired date.